If you choose to mulch your garden beds, there are different options. Consider the maintenance of these options to help you make a good decision for you and your plants. Different mulches give different visual effects. Shredded hard wood mulch makes a tidy, even covering. Wood mulch helps with two things: smothering weeds and helping the soil retain its moisture. Note: Take care when raking leaves out of beds to not also rake out the mulch. Sand mulch has a really beautiful soft look. This sand mulch was put on top of weed barrier cloth. It's important to keep the sand free of leaf litter and debris with regular raking. Note: Sand can be a really excellent medium for germinating weed seeds. Gravel mulch can be installed on weed barrier cloth or not. At least two inches is recommended. The texture of gravel helps fill the negative space between the plants. Note: To keep gravel looking its best, it's important to regularly blow the duff and leaf litter out. If left in, the litter will break down, creating soil, and over time, will cover the gravel. This client chose not to mulch at all. Eventually, native mosses will move in and form a beautiful green crust, keeping weeds out. Note: When weeding as the moss is growing in, it's important not to cultivate the soil too much. This will uproot the moss. Don't feel constrained to one solid style of mulch. 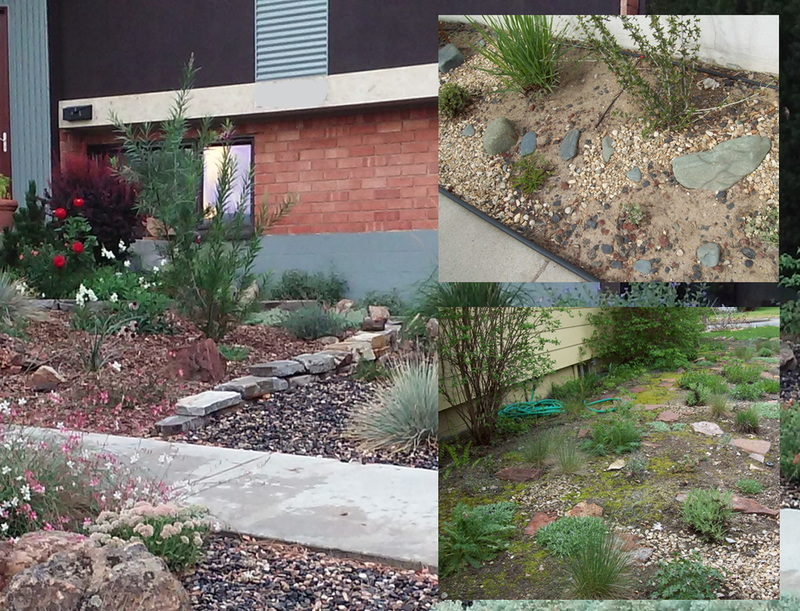 The pictures on the right show some examples of mixing textures to make your garden more interesting. On the left, a small stone wall neatly separates wood from gravel mulch.